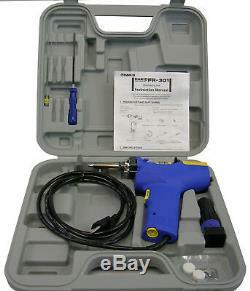 New Hakko Model, FR301-03/P De-soldering gun with Carry Case. 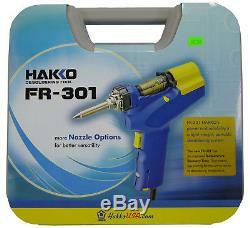 Hakko Model Number FR301-03/P Desoldering Gun Kit. 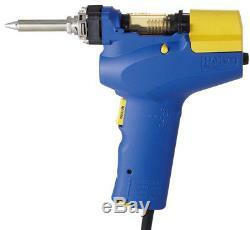 This new desoldering gun from Hakko replaces the FR300-05/P (FR-300) that has been the desoldering workhorse for years. Now improved with more power and reliability & improved temperature recovery. See below for the improvements this tool offers. Comes with carry case, simple stand, cleaning pins for tip and heating element, extra filters. Let us add you to our ever growing list of satisfied customers. (Use on 220/240 volt circuits will require an external step down transformer, not included). The FR-301 Desoldering Tool has everything you love about the FR-300, but with an improved temperature recovery time for greater efficiency. Its quick-change nozzle system uses Hakkos versatile N61 nozzle series tips. The Hakko FR-301 desoldering tool puts the performance of an industrial desoldering station into a compact and lightweight hand tool that can be used on the workbench or in the field. This tool incorporates much of what you have been asking for a longer than normal cord to provide the extra reach, integrated power switch to turn the tool off when not in use, and a quick-change nozzle system. New N61 Series desoldering nozzles optimize performance Easy-to-clean solder recovery chamber minimizes maintenance and reduces waste Fast release tool for the quick-change nozzle system Closed-loop sensor integrated heating system for improved thermal performance Compatible with lead-free solders Ergonomic grip design to minimize stress on your hand and wrist. New pump design that lowers vibration and noise, but improves vacuum pressure and flow. Easy-to-use adjustable temperature control built into the handle. 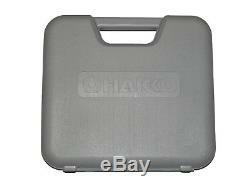 Includes storage case and maintenance accessories. 660° - 930°F (350° - 500°F). Meets or Exceeds IPC J-STD-001. 81 kPa 610 mm Hg / 24 in. 170(H) x 235(W) mm 6.7(H) x 9.3(W) in. Weight (w/o cord & case). Dimensions (w/o case) (L x W x H). 8.3 x 1.9 x 8.9 in. (210 x 49 x 226 mm). Aluminum Pre-Filter (1 installed / 1 replacement). Ceramic Filter (1 installed / 1 replacement). Cleaning Pin for ø1.0mm nozzles. Cleaning Pin for heating element. Ø1.0mm Desoldering Nozzle (installed). UPS does not deliver on Saturday or Sunday. UPS adds a surcharge to these locations. Please message us for availability to your location. Normally, you will receive your item in 6-10 days. If you have questions please message us. Ness Electronics is a major parts distributor doing business in Minnesota. We have been in business since 1964. We are a factory authorized DLP/LCD lamp distributor. We also sell a wide variety of electronic parts and accessories to the technical repair industry. The item "New Hakko FR301-03/P Desoldering Gun Tool FR-301 Replaces FR-300 FR300-05/P" is in sale since Thursday, June 12, 2014. 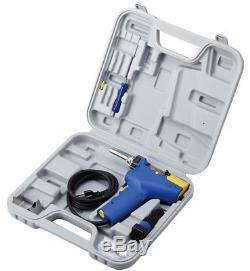 This item is in the category "Business & Industrial\CNC, Metalworking & Manufacturing\Welding & Soldering Equipment\Soldering & Desoldering\Soldering Guns". The seller is "nesselectronics" and is located in Burnsville, Minnesota. This item can be shipped to United States.